MANILA -- President Rodrigo R. Duterte said he is confident that the Islamic State (ISIS) “will never gain foothold” in the Philippines, thanks to the military’s efforts to counter violent extremism. “I am especially pleased with our military's recent accomplishments against the Abu Sayyaf Group. Your efforts have brought us even closer to our ultimate objective of totally crushing violent extremism at its roots,” Duterte said in his speech. “There is the ISIS that we have to worry here in --- well in this part of Sulu, up and down Basilan. 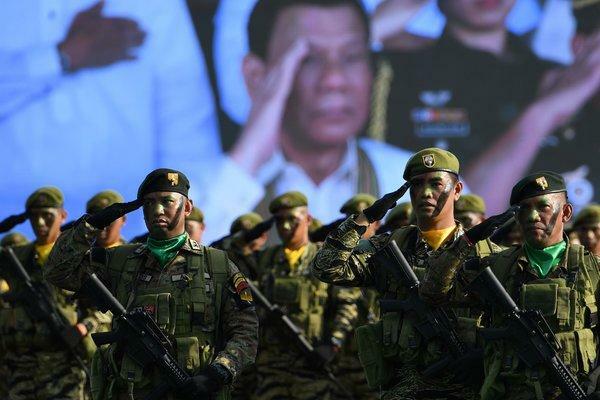 We’ll just have to fight and fight,” Duterte said, assuring the military of “utmost” protection. “But anyway, ang foremost --- ang trabaho ko (my job) is to protect also my soldiers and you will have it,” he said. “Ipinakita nila na ayaw nila at kung ganun lang, bastusan lang rin, eh ‘di --- tapos na tayo mag-usap. Ngayon, gusto ninyo patayan na lang (They have shown me that they do not want to talk. In that case, we’re done talking Now, if you want, let's just fight it out.) I am not ready to talk to any communist guy,” he said.